Nordson (NDSN) was founded in 1954 and manufactures products used to dispense, apply, and control adhesives, coatings, polymers, sealants, biomaterials, and other fluids, to test and inspect for quality, and to treat and cure surfaces. 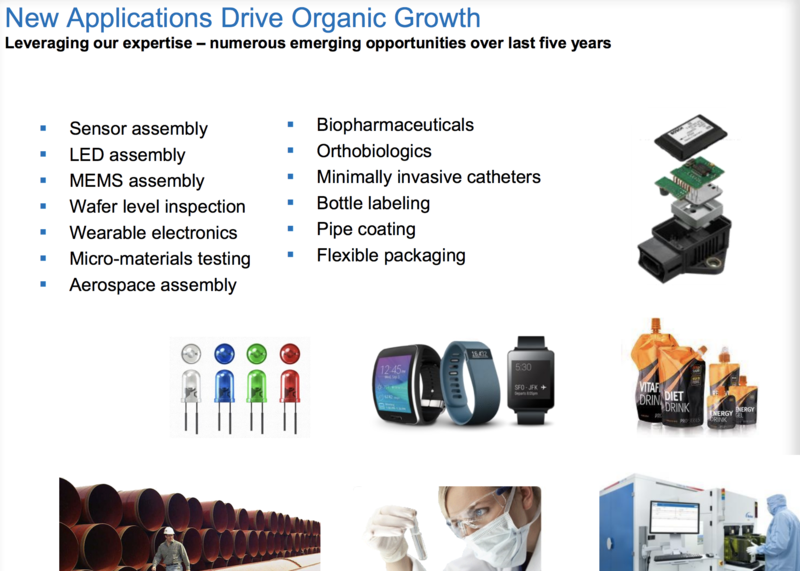 Approximately 47% of Nordson’s revenue is recurring in the form of parts and consumables (tips, connectors, cartridges, valves, tubing, etc. ), creating a highly stable source of revenue and cash flow. The remainder of the business consists of standard product sales and engineered systems used for dispensing. The company serves virtually every end market including packaging, nonwovens, electronics, medical, appliances, energy, transportation, construction, and general product assembly. By geography, Nordson derived 33% of its 2017 revenue from the U.S., 29% from Asia Pacific, 26% from Europe, 7% from Japan, and 7% from Latin America. 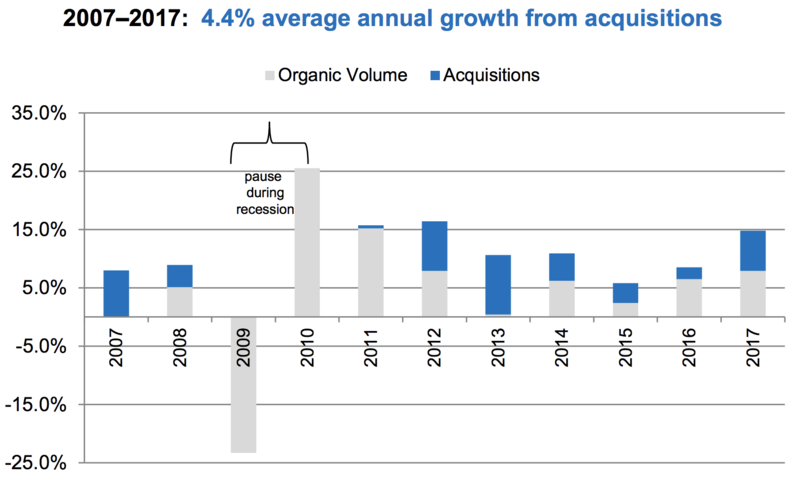 Emerging markets have driven the bulk of Nordson's organic growth over the last decade. Adhesives Dispensing Systems (44% of 2017 sales): products to melt, filter, pump, transport, dispense, and deposit adhesives, polymers and other materials in the manufacturing of a wide range of goods (food and beverage packaging, diapers, labeling, medical devices, cars, furniture, etc.). Nordson's dispensing technologies commonly reduce material consumption, increase line efficiency, and enhance product strength, durability, brand, and appearance. 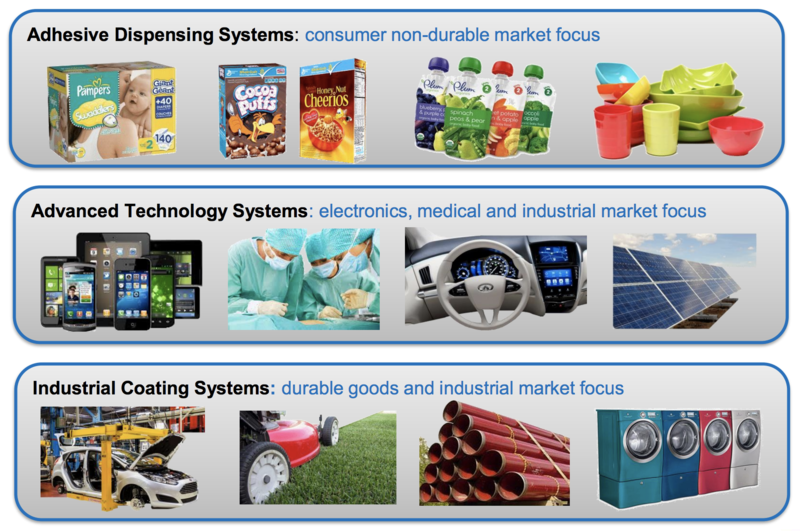 Advanced Technology Systems (43% of sales): precision dispensing, fluid management, test, inspection, and surface treatment products for electronics, medical, and general industrial markets (smartphones, tablets, solar panels, LEDs, medical devices, semiconductor packaging, printed circuit boards, etc.). Industrial Coating Systems (12% of sales): used primarily for applying coatings, paint, finishes, and sealants, and for curing and drying of dispensed material. This segment primarily serves the consumer durables market (appliances, food and beverage containers, lawn equipment, automotive components, pipe coating, electronics, etc.). Nordson has raised its dividend for 53 consecutive years (14th longest streak in America), making it a dividend king. Industrial companies, with their high fixed costs and cyclical operations, are not usually where one might expect to find great dividend growth stocks. However, Nordson, like many industrial dividend aristocrats and kings, has managed to deliver exceptional long-term income growth and total returns. Nordson has been so successful because its solutions help customers increase uptime, boost productivity (i.e. better product yields and faster line speeds), improve efficiency (i.e. reduce consumption of materials), and ultimately achieve a lower total cost of ownership. The cost of Nordson’s mission-critical solutions, many of which are tailor-made to a customer's needs, make up a small proportion of a manufacturer’s total factory and product cost (typically about 5% of a customer's total inputs). As a result, they deliver a high return on investment through the efficiencies and reliability they provide. For example, Nordson’s technology might help a manufacturer produce 10% more volume out of its existing capacity by enhancing production speed. Essentially, manufacturers are happy to pay a reputable company like Nordson to make sure their production lines are operating smoothly and cost effectively. With roots tracing back over 100 years, Nordson has built up a sizable installed base with thousands of customers. Nordson’s solutions are literally installed and serviced at a customer’s manufacturing facility, which creates switching costs. To replace Nordson with another vendor would require halting production and retooling each production line. Few vendors also have the global sales and service capabilities that Nordson had built up over the last 50+ years when it started expanding internationally (the company is in over 35 countries today). Having a large installed base helps Nordson generate strong and consistent free cash flow and provides numerous opportunities for growth as customers’ needs change. For example, a nonwoven customer might introduce a new type of diaper that more closely resembles clothing and requires different manufacturing techniques. As a result, they might need to order a new solution from Nordson, providing growth opportunities for the company. Nordson’s installed base also provides substantial recurring revenue in the form of replacement parts and consumables. Nordson is continuously investing in innovation to stay at the forefront of technological change for its customers as well. The company invests 2% to 3% of its sales in R&D each year and has nearly 3,100 current and pending global patents in addition to more than 100 years of application know-how. The firm's strong intellectual property portfolio helps Nordson differentiate its products, engineer new solutions, and maintain strong pricing power. Acquisitions have been an important part of the company’s success as well. Nordson, like many niche industrial companies, frequently acquires smaller rivals due to the highly specialized nature of these markets. In fact, over the past five years over 50% of the company's cash flow from operations has gone into acquisitions, helping boost Nordson’s sales growth by 4.4% annually over the last decade. Remember that customers are usually unwilling to switch suppliers since they often have long relationships with these companies who typically custom design products for them. Therefore, acquiring smaller rivals (and their established customer base) can be a good way for companies like Nordson to achieve faster growth. Nordson made four acquisitions in 2017, including the $717 million purchase of Vention, its largest deal last year. Vention is a leading designer, developer, and manufacturer of minimally invasive interventional delivery devices, catheters, and advanced components for the global medical technology market. Going forward, management says it has the acquisition pipeline to buy two to three small to medium-sized companies per year. Nordson typically acquires businesses that provide new technologies, sales channels, adjacent markets, and sources of recurring revenue to help it maintain the broadest suite of dispensing, test & inspection, and surface treatment technologies in its markets. 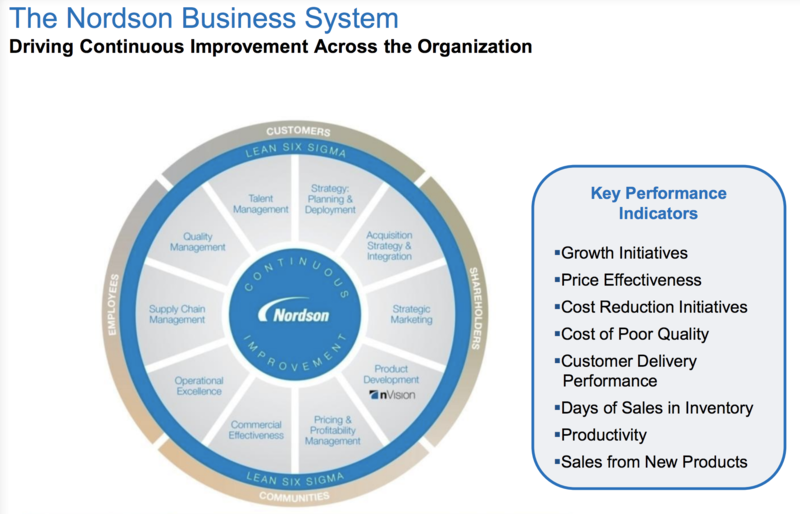 Like many other high-quality industrial businesses, Nordson also has its own continuous improvement program called the Nordson Business System (NBS) to keep the company efficient as it grows. Rooted in Lean Six Sigma methodologies, NBS uses continuous data analysis and clearly labeled metrics to help the company optimize its operations over time. As you can see below, NBS seeks to deliver on a set of key performance indicators centered around growth, price effectiveness, cost reduction, productivity, and other metrics to meet the company’s goals. This type of organizational discipline can be especially effective during periods of slower growth because it can help cushion profits and create stronger operating leverage whenever growth recovers. From factory consolidations to supply chain optimizations and better sourcing of raw materials, Nordson has pulled a number of levers of the years to improve its profitability. Combined with its relatively strong economies of scale in high-margin niche markets, Nordson enjoys some of the industry's best profitability with an operating margin in excess of 20%. Management's discipline is also demonstrated by the company's balance sheet. While Nordson doesn't have a credit rating due to its small size, you can see that the company has been careful to maintain a relatively low net debt to EBITDA ratio over the years. 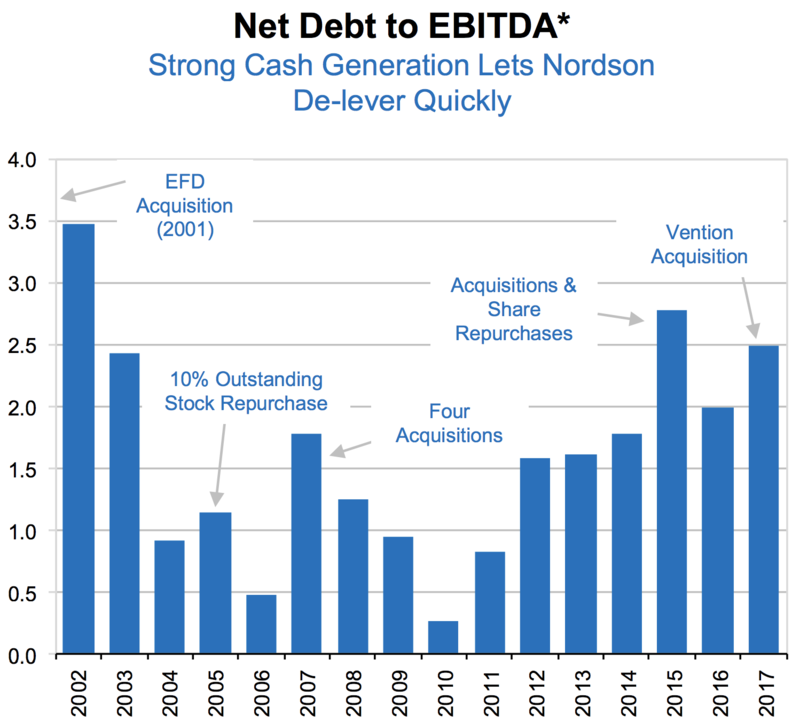 The company's excellent free cash flow generation allows Nordson to reduce its debt fairly quickly after making acquisitions, which has helped keep the firm's borrowing costs very low (an average interest rate near 3% today). In other words, Nordson should have plenty of financial flexibility to continue executing its long-term growth strategy. Through 2023 Nordson believes it can grow organically at a rate double that of global GDP growth (about 6% to 8%). Meanwhile, ongoing margin expansion should help convert that revenue growth into even stronger growth in EPS and free cash flow per share. Nordson's growth plan comes down to three main strategies. First, the company plans to continue increasing its product portfolio, both via R&D investments as well as acquisitions. Primary areas of focus include higher-margin components in the medical and electronics industries. The company's other major growth initiative is expansion of its emerging market operations, both in terms of entering new fast-growing markets, and increasing distribution in existing ones. 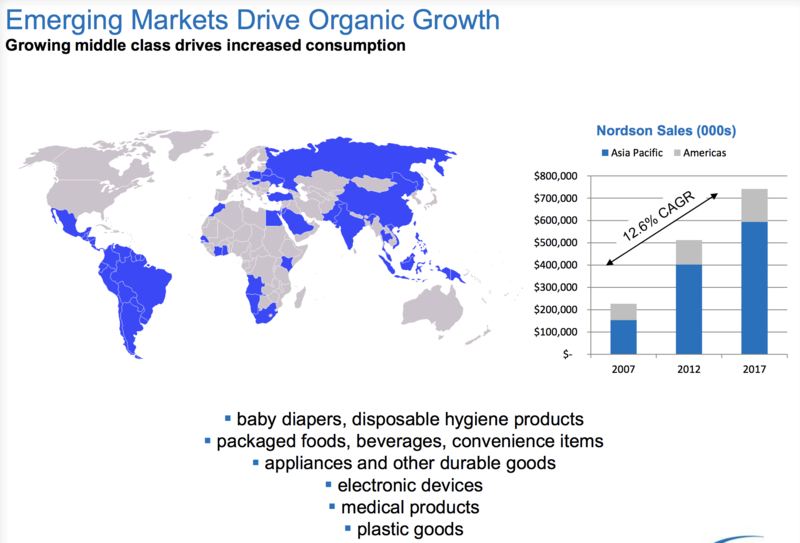 Nordson's organic sales in emerging market have been growing at nearly 13% annually over the past decade. That's thanks to strong increases in demand for consumable products such as diapers, packaged foods, plastics, medical products, and electronics. Finally, management will continue using the Nordson Business System to boost margins over time by streamlining the company's supply chain and increasing automation of Nordson's manufacturing facilities. If everything goes as planned, Nordson should be capable of growing its earnings per share by at least 10% annually for the foreseeable future. Given the company's solid long-term track record and Nordson's relatively small size, that forecast seems reasonable and should continue fueling double-digit dividend growth. Overall, Nordson’s sticky relationships with customers, diversified end markets, solid base of recurring revenue, strategic acquisitions, global service capabilities, concentration in a slow-changing market, and commitment to innovation and operational excellence form the foundation of a strong economic moat. The primary risks faced by Nordson are largely temporary in nature. 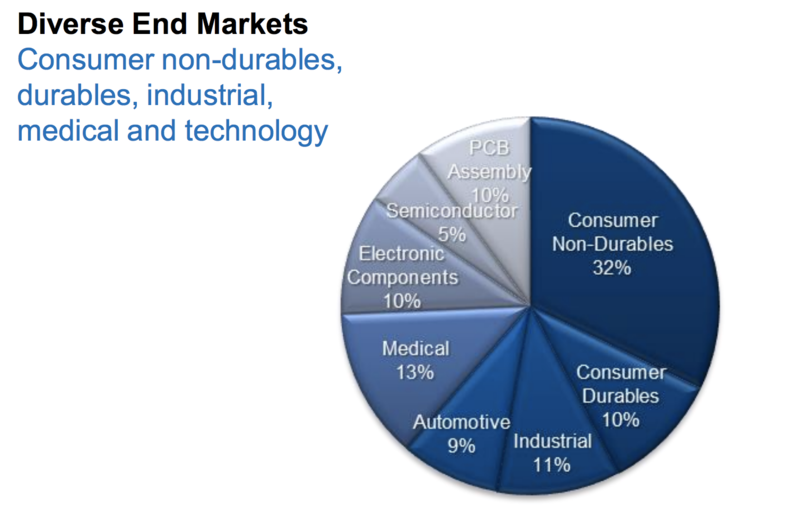 While the business has meaningful exposure to stable consumer non-durable end markets (32% of sales) and generates almost half of its revenue from recurring parts and consumables sales, it is also exposed to cyclical markets such as electronics and automotive vehicles. A slowdown in any of these end markets could directly affect Nordson’s profitability because demand for its products is sensitive to the general economic conditions of the industries and global macroeconomic factors. Currency exchange rate fluctuations and raw material cost volatility (metals, plastics, electronics) can also affect reported sales and earnings growth over the short term. What could potentially impair Nordson’s long-term outlook? A fundamental change in the manufacturing processes used in the company’s largest end markets could reduce the need for Nordson’s systems. If viable economic substitutes for adhesives are discovered or products advance to require much less adhesive, Nordson could experience lower demand. However, this seems like a very low probability event. Adhesives have been in use for hundreds of years and are seeing even more applications for them emerge because they are increasingly lighter in weight and stronger than bolts, screws, and other fasteners. 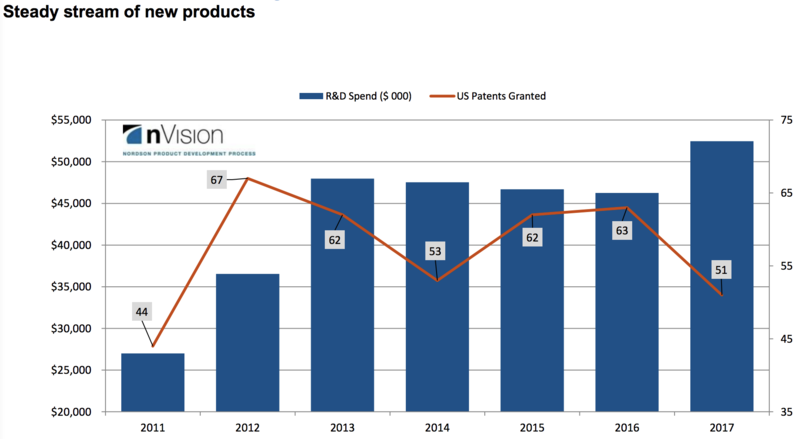 While adhesives appear to have strong staying power, there is still significant execution risk for any company aggressively pursuing M&A as a main component of its long-term growth strategy. Nordson's track record of small acquisitions is good, but even the best management teams can make mistakes by overpaying for acquisitions, encountering integration challenges, or failing to realize expected synergies. New competition is another risk to consider, but Nordson’s long-standing customer relationships, massive installed base, and strong balance sheet are difficult to overcome. For now, the company’s moat appears to have a favorable long-term outlook. Nordson is a boring business that doesn’t get much attention from investors, but the company seems likely to remain a powerhouse in the growing adhesives dispensing market for many years to come. Nordson's large installed base, customer diversification, new product investments, and switching costs all serve as enduring competitive advantages and have helped the company generate one of the best dividend growth records in America. Going forward, Nordson's strategy of expanding into more high-margin products, growing its presence in emerging markets, and generating incremental cost savings should help drive double-digit earnings and dividend growth. While the stock's yield is low, Nordson offers one of the best growth profiles of any dividend king, making it an appealing candidate to consider for dividend growth investors with a long holding period.